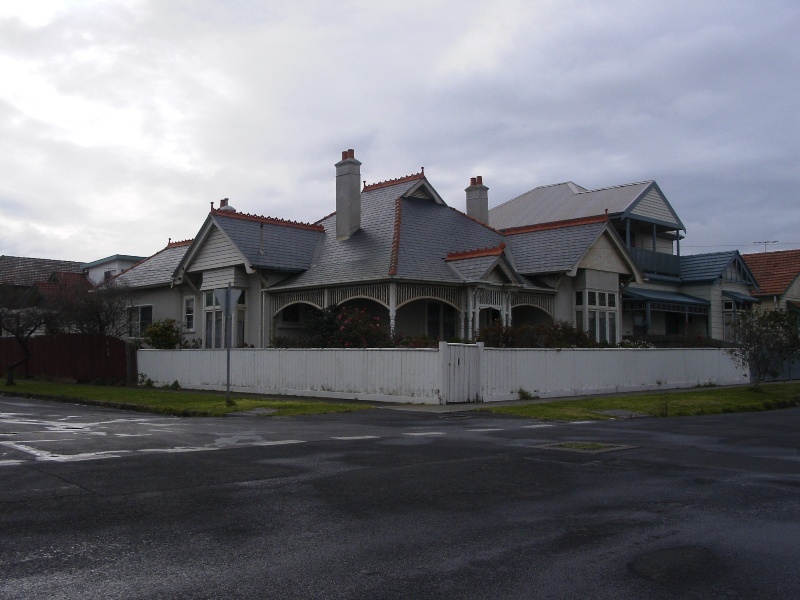 The house, constructed by CF Griffiths in 1915-16, at 1 Forster Street, Williamstown. The house at 1 Forster Street, Williamstown is of local historic and aesthetic significance to the City of Hobsons Bay. The house at 1 Forster Street is an asymmetrically planned, timber board and rough-cast stuccoed Queen Anne styled villa with Marseilles pattern tiled roof gables set against a Dutch hipped main roof. A timber verandah links the two gabled wings, which are at diagonally opposing corners, whilst a minor porch-like gable is set in the main verandah elevation and is supported on duplex posts. Slatted segment-arched friezes ornament the verandah whilst terra-cotta finials and ridging decorate the roof. The main elevation gable may have been trussed (see other gable); the colours is not original, and the fence has been replaced sympathetically. Integrity - Moderate. Condition - Good. The commencement of an early 20th century residential streetscape which shares materials, gabled roof forms, some period detail and siting.